Have you purchased a best and latest smartphone and want to download some great, funny or entertaining mobile apps? But, don’t know where best mobile apps are showcased of different categories? Or are you bored of playing Angry Bird or Candy Crush and want to try something different? No need to worry just visit CDN App Center. 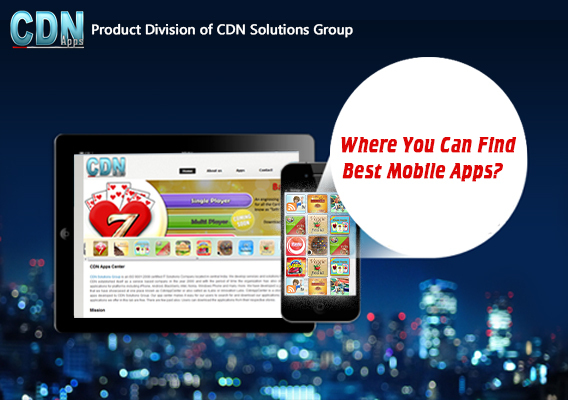 CDN App Center is a free mobile app store where you can find all mobile apps developed by CDN Mobile Solutions. CDN App Center is a product division of CDN Solutions Group. There are lots of different categories in which the mobile apps are showcased, available for trending platforms like Android OS, iOS, Blackberry RIM, Windows OS and others. CDN Mobile Solutions is the mobility division of CDN Solutions Group, and develops different categories mobile apps based on trending platforms specially Android and iOS. CDN Mobile Solutions is continuously developing mobile apps from more than seven years for different platforms and has successfully developed more then 500 mobile apps. At CDN App Center you will find some great entertaining apps like Badam Satii, Car Bingo, Stone Solitaire etc. Some are learning apps or education apps like Flash Card Age 0-2, Fun Learning. Some are utility / lifestyle apps like Flavors of India, Indian Kebab Flavor, World of Chocolate, Masalapdeia, etc. You can find sports app like Crick Predict, Soccer Prediction etc. Means there is everything for everyone. You can download the apps which are showcased at CDN App Center from Google Play Store, iTune Store and Windows Apps Store. CDN Solutions have showcased all in-house developed apps at CDN App Center. CDN App Center is not only a store of mobile apps, you can share mobile app development ideas also with us. If you any great, unique and creative idea then you can share with us, and we will develop exactly what you want. So, it is completely user dedicated mobile app store. So, next time when you search for any mobile app do keep in mind CDN App Center and find the best and awesome apps which you want exactly.